BounceU's Create & Bounce camp program for kids ages 4-11 gives children a daily balance of playtime and artistic expression. 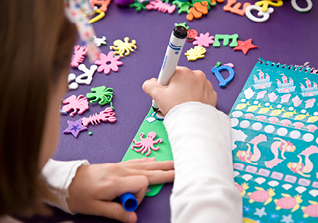 Our carefully developed curriculum includes themed-based lessons in drawing, painting, & sculpting using medium like oil and chalk based pastels, watercolors, mixed media and more. We do not offer refunds for camp days purchased. Our unique Technology Camp features Robotics with LEGO® Mindstorms®. Learn to design, build and program robots! 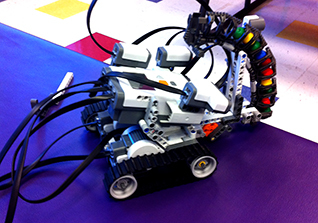 Campers work both individually and in small teams (2-3) using the Mindstorms® Robotics Kit. Our Technology Camp gives children a daily balance of playtime and imagination! It is both FUN and EDUCATIONAL! Join either camp for only half a day. Drop your child off at our regular 9am drop-off time, and pick them up at either 12:00pm noon (before lunch) or drop off at 12pm and pick up at 3pm. If your child is staying for lunch, you can either bring your own lunch, or purchase pizza & drink for $5. Important Note: Children may not be able to finish all of our art projects and tech robots in a half day session.